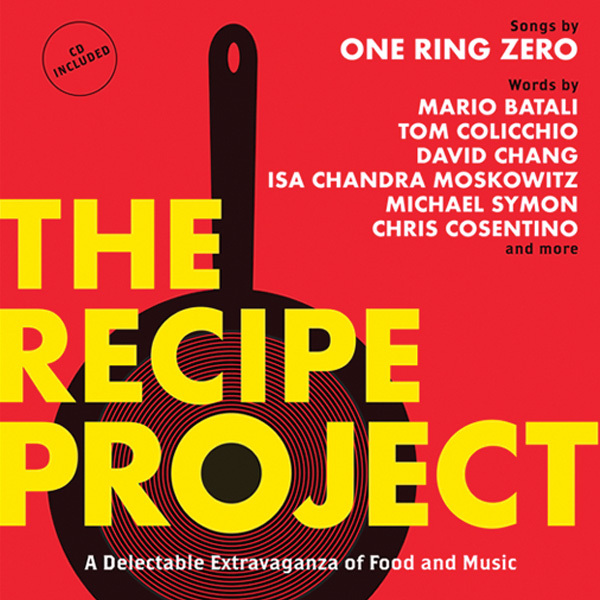 Now One Ring Zero has turned its full attention to the food world, with The Recipe Project, an album and book of recipes from top-name chefs set to music. There’s Mario Batali (“Spaghetti with Sweet 100 Tomatoes”), David Chang (“Maine Jonah Crab Claws wtih Yuzu Mayonnaise”), Tom Colicchio (“Creamless Creamed Corn”) and other chefs familiar from The Food Network, et al. One Ring Zero asked them to submit recipes. . . and amazingly, they did. One Ring Zero’s musical stylings may not be your cup of tea, but the group’s latest project has drawn the attention of food fanatics, proving once again how close a connection exists between food and music, and the people who love them both.